Menorca was recommended to us as a lovely more laid back Island to visit. The apartment which we had is intended for up to 4 people 2 adults plus 2 kids perhaps even then it would be very tight, the kitchen area left a lot to be desired. This area is very isolated and the local supermarkets are very poorly stocked with food no meat except ham so yucky bacon and very pricey. The hotel staff were superb, entertainment very sub-standard day time activities unknown. i went with my family to this lovly hotel and it was my sons 1st holiday i couldnt of chose anywhere better we all loved it there everythink was spot on just amazing !!!!! We visited the aparthotel for the first time this year and were more than pleasantly surprised! We did self-catering, ate in the apartment at lunchtime and ate out almost every evening. We tried the food at the hotel one night and there was a great variety for everyone and it was very good value. There is a beach within walking distance of 5-10 minutes from the hotel and 15 minutes or so walk to the marina in Cala 'n Bosch where there are plenty of restaurants to choose from. The hotel itself was very clean and the grounds and gardens were beautiful. 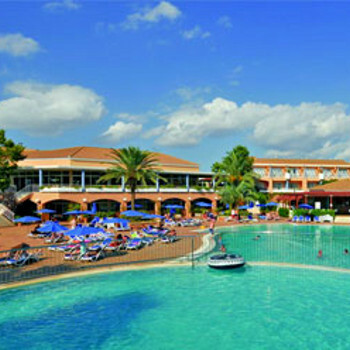 The hotel staff are extremely friendly and helpful and are brilliant with kids. The animation team were lovely and worked very hard to entertain children of all ages. We all would love to go back next year. We have just done 1 week at the Club Princesa Playa in Cala'n Bosch - it was brilliant, better than we'd hoped for. The hotel staff were very friendly and very helpful, as were the Cosmos staff. Our 3 year old little boy fell in love with Hayley, one of the Kids Club Reps, so he thoroughly enjoyed his play sesions with them. The apartment was lovely and very clean as were the pool and site in general. The walk down to the harbour took about no more than 15 mins once down there there was a good selection of restuarants and a few shops. No clubs just some bars. All in all an excellent place for a family holiday. Just got back from a two week break at the Princesa. The hotel is a good 20 minute walk from the harbour area, and this can tiring for little kids. We tried food in the hotel restaurant once, it was ok, but a bit of a scrum and free for all at breakfast. The poolside cafe is ok though. Cleanliness of the rooms is very good, but the pool area could have done with a clean during our stay. (The gardeners came in on our last day and tidied things up). Cosmos kids club is average. If they are not on airport duty or day off then they will entertain your kids with face painting/ playground or a dvd. Our 5 year old was bored of this after 3 days! Heard good things about the hotel's own mini club though. Kids mini disco each night with same songs in same order every night! Look out for the Beijing Acrobats. The best hotel entertainment act I've seen. Best 2 restaurants in my opinion in the harbour are La marina and the Tapas Bar. Britannia Bar sells poor, poor lager and not cheap! Wouldn't visit again. the hotel is lovely, its just its location and there's not that much to see or do in Cala N'Bosch. We have just returned from a fantastic holiday at the Princesa Playa, only 3 negatives - small apartments for 4 adults, lack of storage space and a rip off at the beach for 2 beds and a parasol 21 euros ( we bought a parasol and 2 rush mats from supermarket like the locals do). There were lots of + points on this resort, too many to mention. We were a family group of 10 ranging from adults, teens and a 5 year old. There was plenty to do for all of us, the reps and staff were fantastic and the animacion team were always on the go from 10 in the morning till 12 at night doing the shows etc. even Bobby the life guard they all worked really hard. Our rep Shaun was a great bloke nothing was too much trouble and his local knowledge was brilliant. Everywhere was kept spotlessly clean, the pool and the garden were emmaculate. Nothing was too much trouble for the waiters also, just beware if you have young females in your party it may just be their way but a couple of them were very friendly!! The teens found a couple of places in the Marina that were open till 4 a.m. so they had a great time. (The Shamrock and Chaplins). This holiday can be as relaxing or as busy as you want it to be. The food was good, we upgraded to half board for 7 days and paid for 6 which cost 22 euros a day per person. The food was of good quality and plentiful it was nice to be able to try different dishes as well. El Pato's and La Fontana are good value for money, and next to the Shamrock Bar there is a good Kebab house which does a mean fish and chips and not bad price either. We took the younger children on the train round the resort one morning which cost 7 euros for the round trip which we caught at the bus stop outside the hotel. This was a good way to see round the resort. The beach was just behind the Apartments by the Supermarket, you will have to use you entry card to get back in via the gate by the Tennis courts, this beach was wider than the Marina beach and has lots of little bays in the rocks, but you have to get down there early if you want one of these. The pool was the biggest and prettiest we have ever had, there was the jaccuzzi at the top, the round pool underneath with a waterfall which went into to vast pool, then the toddler splash pool at the far end. At no time did we have to fight for a sunbed there was always plenty, but yes you still get a few who still get up at the crack of dawn to get their towels down and they were not all german most of them were English, and I must admit we did it too if we were up early enough so we could get a Parasol for the little one lol, but not all the time. Hope this helps you. Enjoy. This was our second stay at Princesa Playa and again it didn't disappoint. All the hotel staff were very friendly and the Cosmos Reps were fantastic (thank you Emily, Heather, Scot and Shaun). The hotel is spotlessly clean and the spacious gardens are very well kept. The apartment although not very big is adequate and has everything you need in it. The pool is the best we have ever come across on a holiday. It never seems to be too busy even at the height of the season and the new jacuzzi is lovely. A new splash pool for the kids has also recently been added. There is the usual towels out at dawn carry on but as the grounds are so nice we put our sunbeds there are just walked to the pool. The kids clubs are really good. One and half hour per age group per day (except one day off a week) and party nights for the kids for about 3-4 hours. We felt the kids were safe at all times, the new security gates were a good idea. We didn't eat at the hotel but preferred to walk to the marina or eat at the excellent restuarant (Dulcinea)at Son Xoriguer beach. It is a 10/15 minute walk to the Marina but this didn't bother us. The nightly entertainment is okay. The animation team put on a few shows a week which was a bit dodgy but they tried their best! They have a couple of professional acts flamenco/sound alikes etc and the kiddies disco. This is a lovely family hotel with friendly staff and the Cosmos reps are really good. I'd highly recommend this hotel. We would highly recommend this hotel, we've been on numerous package holidays, and they've all been OK, but I think this hotel deserves some recognition for the effort they put in. The cleanliness is very good all over the hotel, with clean towels, room cleaned,6 days a great swimming pool, with loads of sunbeds.Although it was September! The food is excellent,there is something for everyone, in a huge buffet style, with meat and fish cooked in front of you. Fresh salads every day, a selection of fruits, cheeses, breads,nuts you name it. Drinks are extra in the evening session, but are very reasonable. For daytime refreshments, there is a poolside snack bar, which is fine. Location is quiet, about 15 minutes walk to the mariner area, 5 minutes to a small beach, but perfectly good enough. Bit of a long transfer from airport (90 Min's) but judging by some of the places en route it's worth it. The staff are very pleasant and polite and helpful all the time, which has to be admired considering the hours some of them do. The entertainment is good, in the evenings it starts off with fun for the kids, dancing, playing games etc. Then around 10 there's about an hour by a band of some sort, usually a tribute band. But OK. Yes we would definitely go back. We have just returned from a 1 week stay with 2 kids (10 + 7 yrs). Thought the hotel staffs was superb, nothing was too much trouble and they were always polite and friendly. The animation team were excellent, particularly with the kids. As well as the Cosmos kids club, they also had a great hotel kids club which my children joined in on everything with the added bonus of certificates if they joined in. Really good hotel room excellent with british tv. Food was excellent even though we don't eat meat and had a fussy 3 yr old. Dining room does get very busy though. Would recommend this hotel to anyone with young children as there was so much for them to do. Would probably not be so nice for couples as there was so many (well behaved) kids and entertainment for adults was a bit hit and miss. I am very fussy when I go away and do not usually settle but I was relaxed and comfortable from the word go. Only criticsm would be that marina was a bit of a walk esp. if you have kids and the pool was cold although does warm up the hotter it is. Also the Caln'Bosh beach was crowded and had lots of jellyfish in. Would advise h/b as the resort is very pricy. Will definately go again if funds allow next year.